Cats continue to be cute and endearing pets even as they grow into adulthood. Their almond-shaped eyes, soft little bodies, and beautiful fur colors are adorable. Cats look almost like toddlers when they are sleeping. You can easily train them to use a litter box and they know how to keep themselves clean. Cats are playful, curious, and beautiful. It is no wonder that many people like to keep them as pets. Mimo, a cat in Brooklyn NY, gave internet users something to talk about. Unlike other cats which are content to play around and sleep, Mimo went on a journey of self-discovery. Mimo is a cutie with a small nose, big, curious eyes, and little ears. She is an adorable cat with a purr-fect smile and a great personality. Unlike other cats that shy from cameras, this Scottish kitty seems very comfortable in front of cameras. She enjoys doing typical cat things such as taking a nap, exploring her surroundings, and playing around. When you look at your reflection in the mirror, the things you discover may include lipstick on your teeth or a protruding eyelash. What Mimo found out was a lot more surprising. She was shocked to find out that she had ears. While walking past a mirror, Mimo was curious so she decided to look at her reflection. To her shock, she discovered her ears. The cat appeared to be confused wondering what those tufts of fur were doing on her head and why she had never noticed them before. Finding it hard to believe her new discovery, she took a step back and stood on her hind legs to get a better look. She must have thought that it was a prank or that her eyes were playing tricks on her. It is clear that Mimo recognized her face as soon as she saw it. She, however, could not believe that she had ears. She settles down for a while, changes her position, and goes back to the mirror touching and looking at her ears. Most creatures seem to know their body parts and why they are important. Mimo is different. She adorably touched the top of her ears almost in disbelief that they were a part of her body. Her own reflection seems like a surprise and she had probably never been in front of a mirror before. Who Is the Other Cat? Mimo’s experience is a lot like what human beings experience when they find out new things about themselves. For human beings, it is mostly about character and not physical traits. This proves that self-awareness is not reserved for only humans and that animals can experience it too. It is adorable that she took her time in front of the mirror to discover things about herself but not in a self-absorbed way. Cats are smart enough to know when it is time to strike a pose. 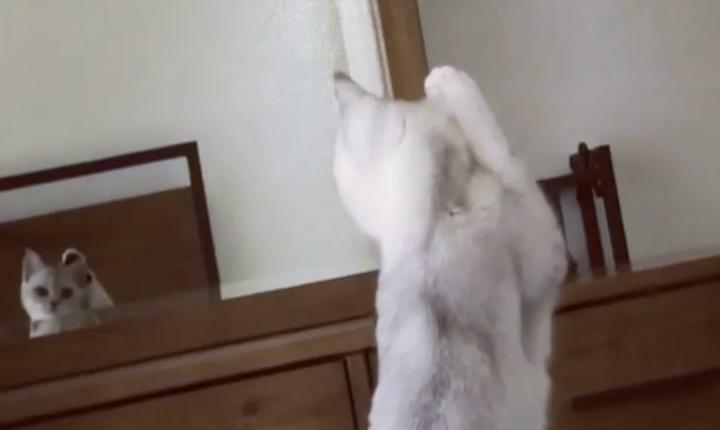 The video of Mimo sharing her experience of discovering herself has warmed up the hearts of many cat owners and lovers. She proved that cats are thoughtful and that they can be just as curious as humans. One can only wonder how she will react when she discovers her little tail chasing after her as she walks. Mimo has become an internet sensation. Internet users have praised her for being as smart as she is adorable. Others think that she was confused because she probably expected to look her human. Cats are among the few animals that can pass a mirror test.